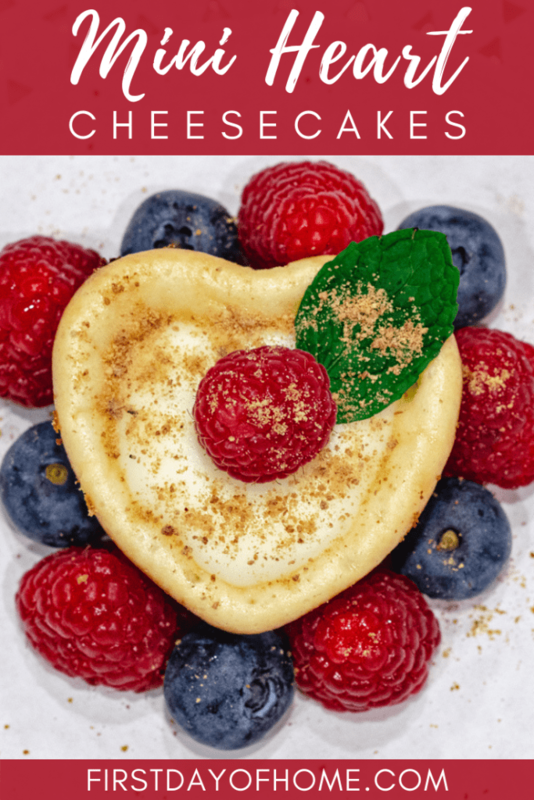 This mini heart-shaped cheesecake recipe ranks among my top picks for any special occasion dessert, but really…who needs an excuse to make this dish when it’s so darn good?! I hope you’ll enjoying having a bite (or five) with this quick and easy recipe, just in time for Valentine’s Day or Mother’s Day. I grew up in a traditional family that expresses love in many ways, not the least of which is sharing good food. My mother, the eldest of six kids, learned to cook traditional Mexican-American cuisine at a very early age. Cooking became her passion. We children became her earnest guinea pigs. …my mom would make these mini cheesecakes. Forget the Cheesecake Factory…we had our own cheesecake manufacturing facility at home! Much like Lucille and Ethel, we gobbled these up as they came down the conveyor belt. Bottom line: These little cheesy bites remind me of my childhood, which is why it’s my great pleasure to share them with you. To begin making this cheesecake recipe, you’ll need the following supplies. While this non-stick pan doesn’t require cup liners, I still recommend using them to make the perfect cheesecake. Below are some of my favorites with a heart or love theme. If you don’t want your mini cheesecakes in the shape of a heart, you can also use these mini muffin tins. You’ll get all of the indulgence and less of the guilt. 1. Begin by beating the softened cream cheese and eggs until smooth. 2. Gradually mix in 1 cup of sugar and vanilla. Set aside remaining sugar for topping later. 3. Pour cheesecake batter into muffin pan until 3/4 full. 4. Bake at 325° for 40 minutes or until set. The cakes should look firm and not jiggle when done.If using a mini muffin pan, the cheesecakes may take 30-40 minutes to bake. Note: Most cheesecake recipes call for setting the pan in a water bath to bake. There’s no need for that in this version. 5. Mix sour cream and remaining sugar. Add a dollop of the mixture to each heart shaped cheesecake, and return pan to the oven for 6 minutes. 6. Cool the cheesecakes at room temperature 20-30 minutes. Tip: If you chill the cheesecakes in the refrigerator, you may have an easier time removing them from the muffin pan, especially if you choose not to use any muffin cup liners. 7. Garnish with the fruit topping of your choice and add graham cracker sprinkles. The recipe calls for cherry pie filling as the topping, which I highly recommend. 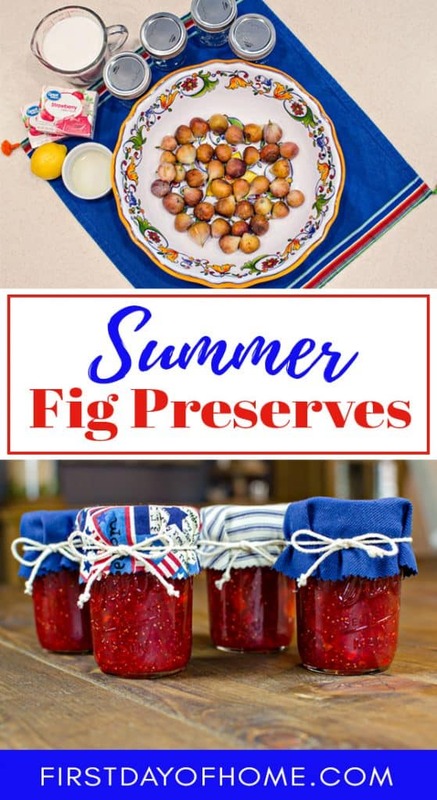 However, you can also substitute fruit like raspberries, blueberries or strawberries, and then garnish with an herb like mint. I love sprinkling graham cracker crumbs on top, like a deconstructed cheesecake. 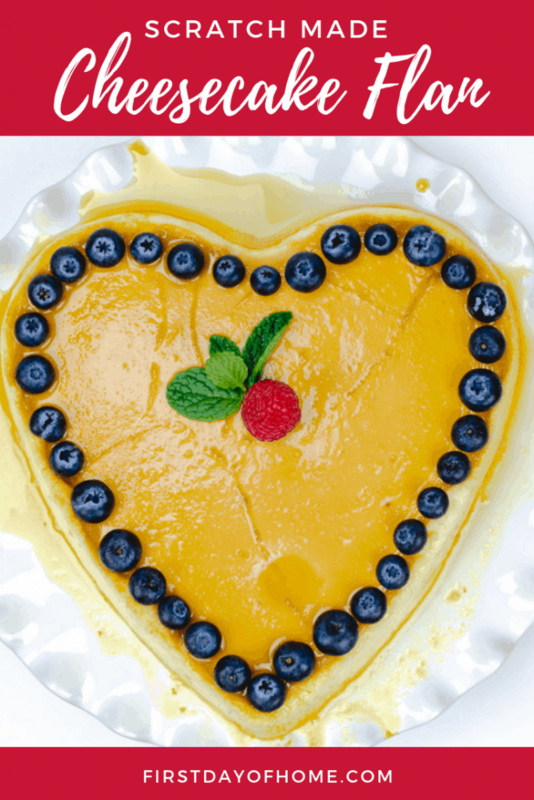 You can display your finished heart shaped cheesecakes with a simple plate presentation, or you can try using a fancy three-tiered tray or platter. Below are a few of my favorite trays, all currently under $30. Store these cheesecakes in the refrigerator in an airtight container for up to 3-4 days. Use a paper towel or plastic wrap under the lid to maintain maximum freshness. Did you know you can freeze cheesecake?! These mini cheesecakes will keep in the freezer for up to one month. The best part of freezing these cheesecakes is you’re always ready to entertain at a moment’s notice. What an easy way to impress your guests! If you end up making this heart shaped cheesecake recipe, please give me a shout on the First Day of Home Instagram or Pinterest pages. 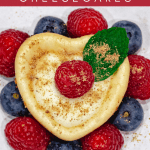 Make delicious mini heart shaped cheesecakes with this quick and easy recipe. 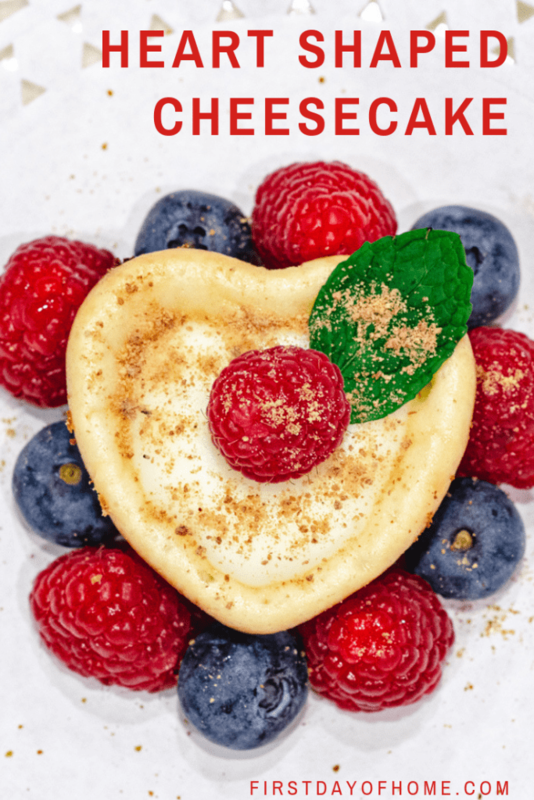 A heart shaped cheesecake makes the perfect addition to any Valentine's Day, birthday, bridal shower, wedding, anniversary or special occasion. Beat softened cream cheese and eggs together until very smooth. Beat in 1 cup sugar and add vanilla. Pour cheesecake batter into muffin tins, preferably with liners, until 3/4 full. Bake at 325° for 40-minutes for regular 12-count muffin tin. Note: The recipe may yield up to 20 cakes. Also, there is no need to use a hot water bath. Blend remaining 1/4 cup of sugar with the sour cream. After baking the cheesecakes, add a dollop of sour cream-sugar blend in the center of the cakes and return to oven for 6 minutes. Cool at room temperature for 20-30 minutes. Before serving, add a spoonful of cherry pie filling on each cake and sprinkle graham cracker crumbs on top. I love the little molds. These are so cute. I love little desserts like this as they are just the right size and everyone gets their own. Thanks so much, Susan! I love personal-portion desserts, too. It makes serving dessert so easy! Just lovely, Crissy, and I love the heart-shaped baking cups! Sprinkling the crumbs on top always looks to pretty, too! I bet you did! Thanks for linking up at Homestyle Gathering! These little cheesecakes are adorable and a perfect bite-sized treat for Valentine’s Day! I can’t wait to try them! Thanks so much, Lynne! I hope you do try them. They are delicious! Love your sweet and pretty cheesecakes! I am pinning this so I can make them for my family! Enjoy your Valentine’s Day! You’re so sweet, Lauren. I do hope you enjoy making these for your family. Let me know how they turn out if you do! Happy Valentine’s Day!